On Thursday, we’ll be headed off to the Disney Social Media Moms Celebration. The girls are so excited. We’ve been building some special character themed outfits to make the experience even more magical. Allison has created a sweet little Minnie Mouse outfit and Rachel got creative putting together her own stylish version of Winnie the Pooh. I’ve opted for a classic and casual rendition of Snow White. Yes… of course there will be pictures! You’ll just have to stay tuned! 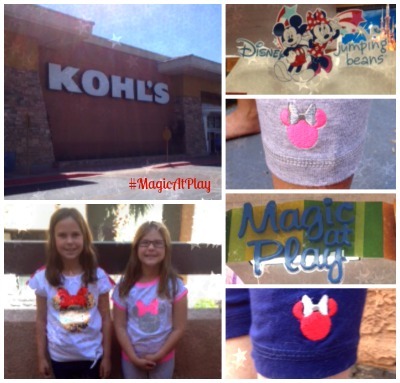 In the meantime… the generous people at Kohl’s have reached out to me with a $50 gift card to deck the girls out in a brand new Disney apparel line by Jumping Beans! At first, I thought the girls might be too big for Jumping Beans. I remember buying sweet little rompers and mix and match pieces for them as babies and toddlers. But guess what? Jumping Beans offers clothing up to a size 7 in both boys and girls. (The website says 6X for girls… but I can attest that the clothes I purchased were indeed a full size 7). They’re thrilled to wear these outfits as we drive the 6 hours to California and meet up with our old friends and colleagues. And now you can win a $50 Kohl’s Gift Card too! Simply enter using the Rafflecopter below!